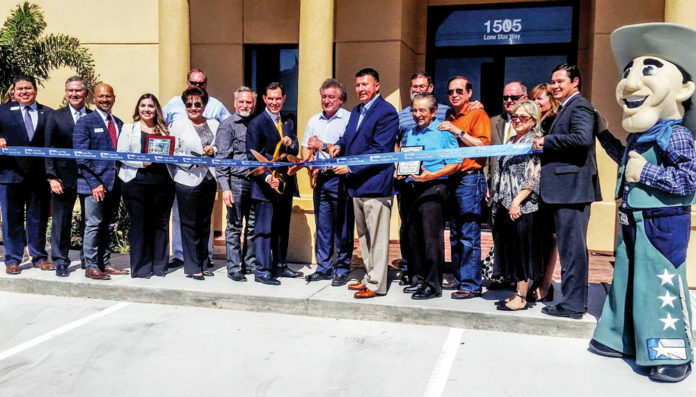 Officials of Lone Star National Bank are flanked by city officials and other dignitaries as they cut the ribbon for the latest LSNB branch office at Freddy Gonzalez Dr. and N. 10th St. in Edinburg. EDINBURG — Ribbon-cutting ceremonies were held Thursday for the newest Lone Star National Bank branch. Located at the northeast corner of Freddy Gonzalez Drive and north 10th Street, the facility becomes the bank’s second location in Edinburg and the 31st overall for the locally-owned banking institution. About 100 people attended the ceremony, including bank administrators, city officials and members of the public. LSNB President David De Anda told the crowd that the event reflects the bank’s ongoing mission to foster the Rio Grande Valley’s growth. Lone Star National Bank was founded in Pharr in 1983 in a temporary building with 10 employees. Today, it includes locations from Rio Grande City to Brownsville and one in San Antonio. Bank officials credit the institution’s rapid growth to several factors such as offering personal “value-added” customer service and providing a rewarding environment for its employees.